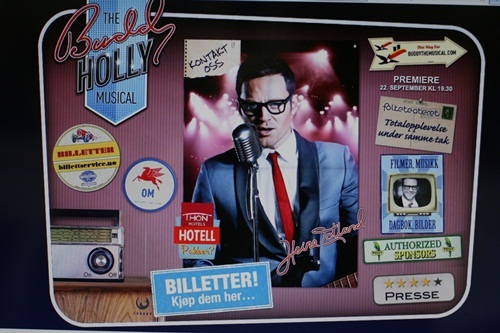 Last thursday I went to see a musical about Buddy Holly. My friend Linda asked a while ago if I wanted to go and even though I didn’t know much about it, I said yes. I know Buddy Holly and some of his songs and I know Heine Totland (who plays Holly) as a good artist. So Linda, her boyfriend, her brother and I went to Folketeateret to the Buddy Holly musical. I had no expectations to the show, since I hadn’t read much about it. I’d only seen a commercial of it on TV. After the show, which has played since the end of September, I read some reviews of it. They have been so-so. It woudn’t have mattered if I’d read the reviews before I decided to go or not. I would’ve gone anyway. I’m pretty open-minded, so the reviews wouldn’t have affected me. It’s only one persons opinion. The show (show fits better than musical in my opinion) was great! I loved it from the very beginning! It was like we were put in a time machine and taken back to the middle of the 50’s. It was like we where there. We got to see his life – from the start of his musical career to he died in a aircrash about three years later. The stage were build in a great way. The walls, the acceories and everything was built in a great way. It was exactly how I would pictured the 50’s to be. His music got, of course, a big part of the show. We got to hear many of his hits like Peggy Sue, Everyday, Oh Boy, Heartbeat and That Will Be the Day. Buddy Holly put rock ‘n roll on the map and the songs mentioned proves he did a great job. The show was divided into two parts, with a 20 minute break in between. The second part was when everything exploded. It was like a little Buddy Holly concert. We also got to see ‘Ritchie Valens’ sing La Bamba; that was so cool! His moves were incredible. At the end of the show everyone in the audience were standing up clapping and some were even dancing. The show ended with a bang! Have seen the show, I don’t understand why the reviewer doesn’t give this show great reviews. I think it was awesome! If someone gave me a free ticket, I would go again! Inthe aftermath of the concert, I’ve created a Buddy Holly playlist on Spotify. It’s happy music! And it gets me in a good mood to listen to it.